Bane will play their last show in their hometown on 18th June before they will break up. Therefore the band will play more than 30 shows in the whole US. 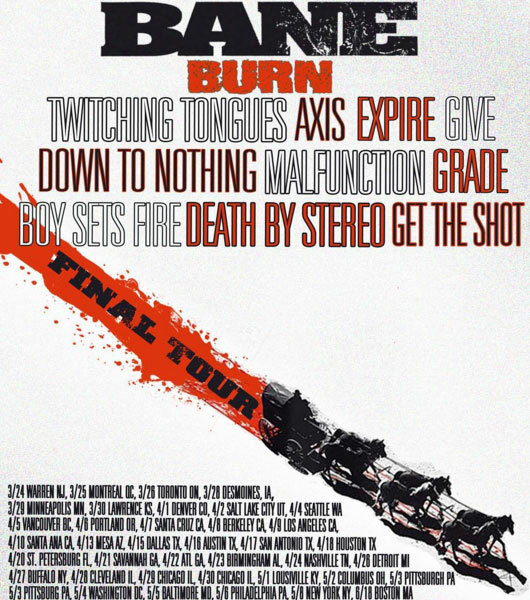 Following bands will support band on their final tour: Burn, Twitching Tongues, Down To Nothing, Axis, Expire, Give, Malfunction, Grade, Boysetsfire, Death By Stereo, Get The Shot. So much thanks to @noraanraad for designing the poster and doing so much for us in the design world over the years. We love you.